The puppy looks on the crate as a den and a “security blanket”. 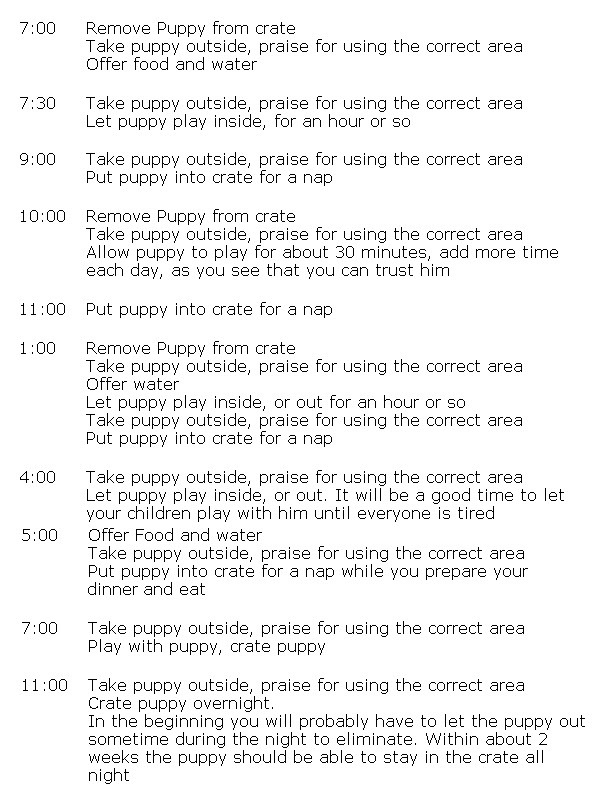 If the puppy can avoid soiling the den it will, this is the basic principle behind crate training. As the puppy learns what you want when it goes outside it will take care of business faster. Always pick your puppy up and carry it out, use the same general area and praise when it eliminates. This will reinforce the behavior you want. If you work at it you can have your puppy completely house-trained in about 2 weeks, with very few accidents. After naps, after playing and after eating always be sure the puppy goes out. As you see that you can trust your puppy give it more and more time out of the crate. Young puppies will chew so, don’t leave them alone too long without supervision, they will get into trouble, and it will be Your Fault, Not The Puppy’s!! !